I remember flipping through catalogs and coming across the Samba Derivatives…I thought they were awesome. 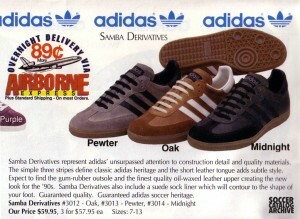 Everyone seemed to have Sambas growing up…I was never crazy about the traditional pair. I think I was turned off by the fact that they were so popular. I saw kid wearing a pair of the Oak Derivatives while watching my older sister’s indoor game. He was the best player on her team…my mind was set…I had to have a pair of the Jack Tripper-esque Sambas. There was one problem…the Samba Derivatives were only sold for a limited time. Eventually I came across a pair…in a Play It Again Sports store. Yep…I bought and wore a pair of used shoes. It kind of grosses me out now…but at the time, at the time I didn’t care. For those keeping score at home, they looked better than they felt. I got so many blisters from those bastards. The scan is courtesy of the Fall 92/Spring 93 Soccer World catalog.